OVERVIEW: The Kenmore 5791 Side by Side Refrigerator did an excellent job of maintaining temperature and running quietly. It hasattractive styling and a highly durable door face. We didn'tlike the fact that there was no pull out shelving and the fact that theicemaker was extremely slow. But all in all this model was agood deal for the money. STYLE: Thestyling of this model we felt was adequate for the price. It's rather modern and sleek and we feel it will blend nicelywith just about any kitchen decor. CAPACITY: ThisKenmore Fridge Freezer has a 25.3cubic footinterior. 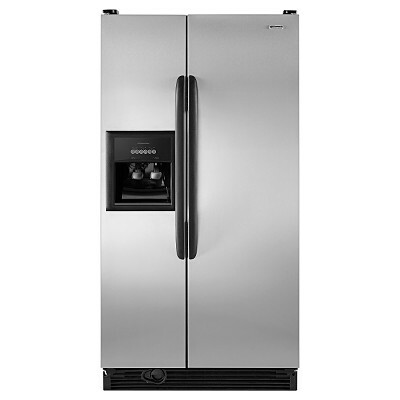 The ice maker and water dispenser take up a lot ofstorage space in the freezer considering there is 10.6 cu. ft. ofmeasurable space but only about half of which can be utilized. However, it was still enough to fit our "family of four" testfood stock. NOTABLEFEATURES: Although the Kenmore 5791 isn'texactly loaded with features, the features it does have workedperfectly. The Pur II water filtration system worked great. As we mentioned above the icemaker was a bit on the slow sideand the more advanced storage features like pull out and split shelveswere missed. EFFICIENCY:It’s ENERGY STAR qualified which will save you money on your energy bills as well as it will entitle you to take advantage of the Energy Star Rebates . DIMENSIONS: Itsdimensions are: DEPTH – 33 7/8in, WIDTH – 35 1/2in,HEIGHT 68 7/8in.